Curious to find out more, we subsequently bought the book, “A WORLD WITHOUT CANCER” by Dr Margaret Cuomo, a board – certified radiologist (more details at the end of this article). b) One cancer expert has called our approach to cancer “damage control”. We deploy the heavy artillery to kill as much of the cancer as we can, hoping that it doesn’t escape our weaponry. However, all too often it does (page 10). c) When it comes to treating cancer, we seem to be in a holding pattern (page13) Cancer has turned out to be far more clever than we imagined… it is able to develop resistance even to highly toxic drugs… it has an uncanny ability to outwit the therapeutics sent to inhibit its growth (pages 12/13). What are Dr Cuomo’s views on cut, poison, and burn (or alternatively known as surgery, chemotherapy and radiation)? Sometimes, surgery isn’t an option. Tumors may be inoperable because they are weakened in an area that’s almost impossible to reach, or a patient may not be strong enough to withstand surgery (page 64). Today’s surgery may be safer than it was, but in many cases, it still doesn’t cure the disease. Cutting out organs and tissues does little to fight cancers peripatetic capacity to travel through the blood to colonize other parts of the body (page 13). Pharmaceuticals, collectively called systemic therapy “include 3 major groups : chemotherapy, targeted therapy, and hormonal therapy (page 65). Whether administered as neo-adjuvant therapy (before surgery or radiation) or adjuvant (after surgery or radiation), physicians sometimes avoid the technical language and simply call them “poison” – what we want the drug to do is kill cancer cells. Unfortunately, they can kill normal cells as well… “Chemotherapy is like taking a stick and beating a dog to get rid of fleas” (page 65). Chemotherapy can be especially grueling, with many patients receiving one drug after another. “Usually the first treatment regimen works and then it stops working after a certain point” says Dr Nicholas Vogelzang of the American Society of Clinical Oncology (page 57). The toxic effects of chemotherapy are not limited to cancer cells. Every drug has its own package of debilitating and sometimes bizarre side effects. Some of these occur during treatment and immediately afterwards, some occur five or more years later (page 67). According to the American Society of Clinical Oncology, late effects can strike just about anywhere in the body – including the heart, lungs, brain and spinal cord, bones and joints, endocrine and digestive system. Even dental and vision problems can occur (page 68). When it comes to chemotherapy, no patient emerges unscathed, and the benefits may not last. If cancer cells became resistant to chemotherapy, as often happens over time, they begin to multiply again. The question for patients is always whether the gain in longevity will ultimately outweigh the brutality of the treatment (pages 69/70). Even drugs used to treat the side effects of chemotherapy have been linked to secondary cancers (page 69). Most of the drugs we have to fight solid tumors influence a specific part of a cellular cycle and have only a transient effect. They don’t stop the progress of a tumor indefinitely. A slow growing tumor is still growing and is perhaps beginning to spread undetected elsewhere in the body (page102). Lastly, many drug therapies are not even studied on the basis of their impact on overall survival, but rather on their impact on progression-free survival or the maintenance of stable disease. There is a big difference (page 101). Although we have gotten much better at aiming radiation directly at a tumor, we can’t target it with the precision necessary to burn only cancer cells and leave healthy ones intact. That means that this therapy, too, is damaging (page 75). Months or even years after radiation, chronic side effects can surface. With radiation, as with chemotherapy, the list of potential problems is lengthy (page77). Most troubling is the possibility that other cancers will emerge, often near the original site, long after receiving radiation therapy…children who survived cancer were 15 times more likely to die of a subsequent cancer later in life (page 79). Though the young are most vulnerable, secondary cancers can develop as a result of radiation at any age. Good medicine is built on clinical trials in which promising scientific discoveries are tested in human beings (page 138). Too often, clinical trials fail to discover who benefit from a therapy and who will be harmed (page140)….we need to be doing the studies that will tell us which patients require chemotherapy (page 141). ….because we don’t know the profile of those who will gain, almost all patients routinely get chemotherapy……that translates into giving therapies that fail 95% of the time in order to find that 3 to 5% of responsive patients (page 141). The fact that we have made so little progress after a century of using the same basic techniques surely suggests that we aren’t taking the right approach. The problem? “Even one cancer cell can lead to death” says James Holland, MD a distinguished professor of neoplastic diseases at Mt. Sinai School of Medicine in New York City. Relapse is always a possibility until we can guarantee that there are no cancer cells in the body (page 79). When death can come from a single cell that successfully eludes our most brutal attempts to cut, poison, and burn it the sword of Damocles hangs over every patient’s head (page 59). We should differentiate between drugs that make a small difference and drugs that make no difference at all. A lot of cancer drugs are not worth very much in terms of prolongation of life (page 110). Meanwhile, our continuing emphasis on producing, prescribing, and paying for one marginally useful cancer therapy after another suggests that we are in the wrong playing field (page 124). In conclusion, when Dr Cuomo commented in The Final Word (page 244) that, when President Nixon launched “a great Crusade against cancer in 1971, he said that a long shadow of fear darkens every corner of the earth” So it is today. 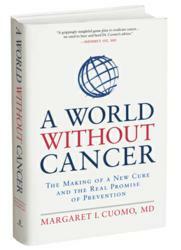 We need to rekindle the effort to eradicate cancer that began four decades ago (page 245). Also, without question (Dr Cuomo’s views), fighting cancer remains highly profitable. The drug companies have all the incentive to keep their research focused on developing powerful therapies, rather than on eliminating cancer altogether (page 66). Dr. Margaret Cuomo, the author of “A World without Cancer,” is a board-certified radiologist and an attending physician in diagnostic radiology at North Shore University Hospital in Manhasset, N.Y. for many years. Specializing in body imaging, involving CT, Ultrasound, MRI and interventional procedures, much of her practice was dedicated to the diagnosis of cancer and AIDS. 1) THE COMPASSIONATE ONCOLOGIST by Dr James W. Forsythe, MD, HMD. Read why Dr Forsythe left conventional oncology and find out why conventional cancer treatment is…often it is akin to entering a dark room with a handful of darts and hoping to hit the centre of the dart-board blindly (page 127). When cancer is exposed to chemotherapy, drug-resistant mutants can escape. In other words, just as resistant strains of bacteria can result from antibiotic use, anticancer drugs can produce resistant cancer cells (page 37). The number of mutations shoots up exponentially as a cancer patient is treated with drugs such as chemotherapy, which inherently causes more mutations (page 39). When chemotherapy drugs bind to DNA, they can cause cancer just as radiation can cause cancer by mutating the genome. This helps explain why survivors of breast cancer, for instance, can suffer from leukemia later in life due to the chemotherapy they received to cure their breast cancer (page 39). “I would not recommend chemotherapy if I did not think that the benefits outweighed the risks.” I was so out of step with the other practicing medical oncologists that it became clear that I could not make a living with such a conservative treatment philosophy. Dr Cundiff just could not stomach what he saw and practiced. 7)INTEGRATIVE ONCOLOGY by Dr Donald Abrams, MD and Dr Andrew Weill, both Professors of Clinical Medicine and oncologists….wrote on the toxicities of conventional treatment and…..”the well known potential to cause mutations and malignant transformation” (page 8). 8) WHAT YOU REALLY NEED TO KNOW ABOUT CANCER by Dr Robert Buckman, MD, a medical oncologist and Associate Professor, University of Toronto. 9) ENZYME FACTOR by Dr Hiromi Shinya, MD, a Clinical Professor of Surgery at the Albert Einstein College of Medicine and Chief of the Endoscopy Unit of Beth Israel Hospital in New York. Dr Shinya firmly believes anti-cancer drugs do not cure cancer… Read to find out why. “medical treatment of cancer for most of the past century was like trying to fix an automobile without any knowledge of the internal combustion engine or, for that matter, even the ability to look under the hood” (page 63).